Pet Friendly Home with Double Waterfall Pool, sleeps 16, 4 bedroom 3.5 baths and 2 Kitchens. Downstairs is a 2 bedroom, 2 baths that sleeps 8. There is a Queen, 2 sets of Bunk beds and a Queen Air Bed in the living room, and High Speed Internet in the downstairs. Down stair fully renovated and Only the downstairs is Pet Friendly. Upstairs is a 2 bedroom, 1 bath that sleeps 8. There is a Queen, 2 twins, double futon in the sun room and Double size sleeper in the living room. It is a short distance to the ocean on our beautiful non driving part of the beach. This home is beachside but not Oceanfront. Canoe launch at the end of the block, 1/2 bath and laundry room next to the pool for easy access while relaxing in the sun and an outside shower. For your comfort and convenience, our home is smoke-free. New Smyrna Beach has plenty of visitors, without facing the overcrowding of the downtown beaches and you never have to worry about or pay for parking! You can roller-blade, bike or walk without the safety concerns of the overcrowded, congested areas. We have easy access to the amusement parks in Orlando, the famous Daytona International Speedway which features racing on select dates and track tours year round, the Kennedy Space Center and much, much more! toilet, This half bath is in laundry room right off pool area. outdoor shower, Outdoor hot & cool shower on left side of garage near pool. We are 4 houses from of Atlantic Ave.
You have two kitchens one up stairs and larger one down stairs. Does not have handicap rails. Great choice. Great location. Big house and accommodating. Wonderful place to stay. well stocked, clean and relaxing. Great place for our 2018 family reunion. Two areas (up and down) so plenty of room for our group. Well stocked with linens, towels, beach chairs, dishes, and all the necessities. ...no big skillet to cook with though. We walked to the beach everyday, walked kayaks down the road to the canal, took long walks everyday through the surrounding neighborhood, played in the pool and corn hole in the big back patio area. Beds were comfortable, nice patio area with seating and grill. Nicely decorated for Christmas too! Would definitely come again. Our family came from all over the country...flew in to Daytona and drove and NSB and this house was perfect. Thank you! Terri is a wonderful hostess and a pleasure to work with. Our family loved gathering at this home and spent one day at the pool and the next day at the beach. 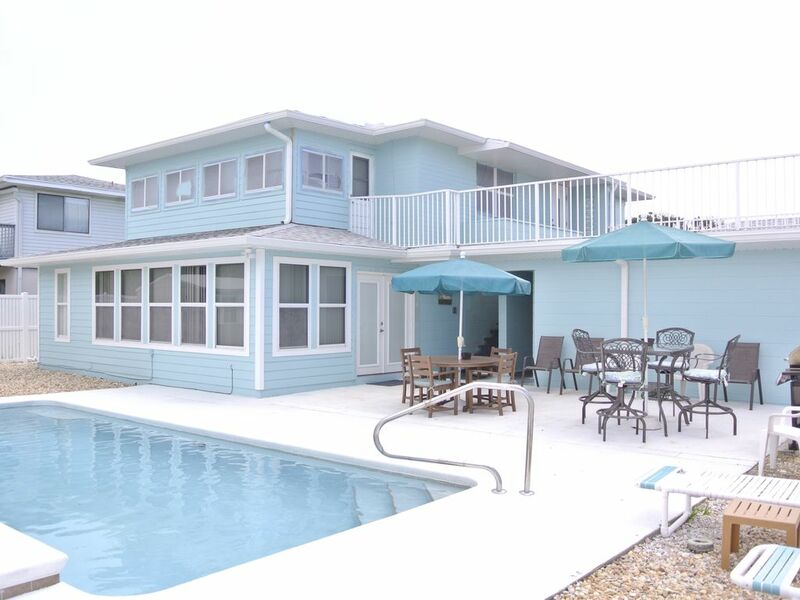 We enjoyed having the two separate living areas, TVs to watch football, the great pool, room for a cookout, and beach access not too far away. Summer season is only Saturday to Saturday rentals only.